NASA wants your vote for space shuttle wakeup songs. The space agency is once again inviting the public to get involved in the long tradition of rousing astronauts on space shuttle missions with specially chosen songs. A total of 1,350 original songs were submitted to the competition to be played for the crew. The so-called NASA Space Rock Committee has completed the judging and narrowed that list down to 10 finalists. The contenders include songs with names such as "Boogie Woogie Shuttle," "Spacing Out," and "The Countdown Blues." Public voting opened today, and will run through the shuttle Endeavour's launch. 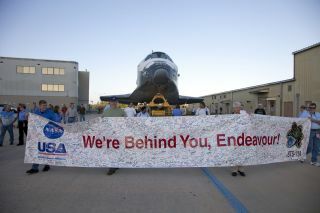 The two songs receiving the most votes will be played during the last two days of Endeavour's planned 14-day mission. During shuttle missions, astronauts are regularly treated to a daily wakeup song, which is typically picked for individuals on the crew by their families. The winner of Discovery's contest was Colorado-based rock band Big Head Todd and the Monsters, with their song "Blue Sky," which was inspired by former NASA astronaut Eileen Collins, the first female space shuttle commander.